Have you read or heard any Tim Ferriss material? He's the guy who coined the phrase Four Hour Work Week, and then wrote a book called Four Hour Body. He is famous for 'hacking' traditional thinking and beliefs about effectiveness in order to deliver excellent results in less time. While I never really got the Four Hour Work week methodology pinned down as many of my own underlying beliefs keep me focused on time in the office - I do get the principle. And I truly loved his Four Hour Body principles of minimum effective dose and the 80:20 rule. In fact, I loved it so much that I now apply that in almost all that I do (working out, working in my role, strategic career moves), to maximise effectiveness. And you can too. Most of spend lots of time working in our roles. We work hard, we do great work, we focus on over delivering (rather than under delivering) - and these are all great things in and of themselves. But do they work long term? Are they effective when it comes to fast tracking your career? Does working hard, over delivering and doing great work actually get you into a leadership role? If current numbers of women in leadership roles is any indication - I suspect not! The Goldilocks Principle is all about not doing too much, not doing too little, but doing just the right amount. That's right, finding the sweet spot, the most effective zone or the minimum effective dose. So you are really asking yourself - what is the minimum amount (one thing) that I can do/take/have that will help me achieve my desired result? Not too much, not too little, but just right. You've got it - the Goldilocks Principle. So if you get this Goldilocks Principle right you won't under deliver, you won't be worn out from over delivering, and as a result you are far more likely to hit the zone. So how do you work out this dosage? How do you know what the Goldilocks zone is? Because when most of us apply the 80:20 rule (otherwise known as the Pareto Principle) we aren't really sure which is the 20% that is actually going to deliver the 80% result. "What is the one most effective thing I can do today that will help move the dial on my career?" 2. Then work out how to do it - plan it, schedule it, create space to do it. 3. And most importantly, go do it. Don't just think about it and let it slide because other more urgent things come along or the resources aren't quite right, or you run out of will power at the end of the day. Just do it. Because we all know that you can think about the dirty dishes, you can make a plan for doing the dirty dishes, but until the dishes get washed they will remain dirty. It also means you will need to become more efficient and effective with your time in order to fit the "one thing" in because the rest of your work will still need to be done. You'll need to work far smarter. I'm a great believer that work expands to fill the time allocated so compressing time in this way means we simply stop over polishing the job, get out of our own way and execute really efficiently to deliver the same result. And most significantly, it's strategic. Stop being busy and start being strategic. Play a strategic game. What's the one thing I can do today to move this project forward? What's the one thing I can do today to manage my team better? What's the one thing I can do today towards meeting our strategic objectives? What's the one thing I can do today to meet my monthly financial targets more easily? What's the one thing I can do today that will help me keep marketing my services while I'm busy delivering for clients? What's the one thing I can do today to get published in (insert name) magazine? What's the one most effective thing I can do today that will help my career? It's that easy. Yes it's simple. Yes, it's elegant. And yes, it works! I recently read about innovator and entrepreneur Stephen Shapiro who has put something similar into place as a bit of a social experiment. Since 1 January he has challenged himself to just work one hour per day and yet still deliver the same results. Yep, you read that right - he is going to work just one hour per day with the aim of delivering the same results. Scary but true. In fairness he has staff and is leveraging existing relationships and resources more effectively, and definitely working smarter, not longer etc but ...... it still an interesting concept. And while it sounds really fun and challenging, for most of us, the boss expects us to physically be in the office most of the day and would probably focus on "well if you can achieve all that in an hour, what else might be possible in 8 per day?". You can read more about that project here. 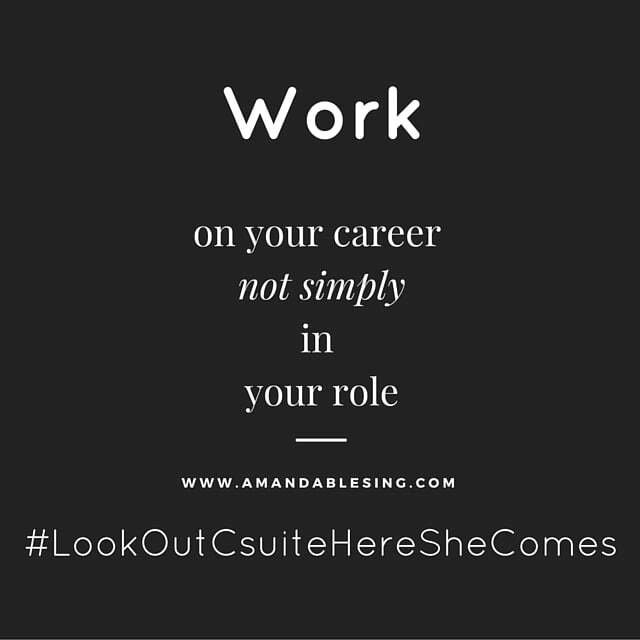 So before you leave work today (or start work tomorrow) I want you to ask yourself - "what one thing can I do that will help move the dial on my career? ", then diarise it, make a plan to execute and make it happen. Then do it again the next day.